Coral Isles is the best Reef Friendly and Safe, Oxybenzone-free and Octinoxate-free sunscreen on the market. Coral Isles rubs in like a lotion and is non-greasy/ non-fragrant. Chemical Sunscreens work by absorbing the UVA/UVB rays from the sun, while Mineral Sunscreens sit on top of your skin and deflect the rays like a mirror. 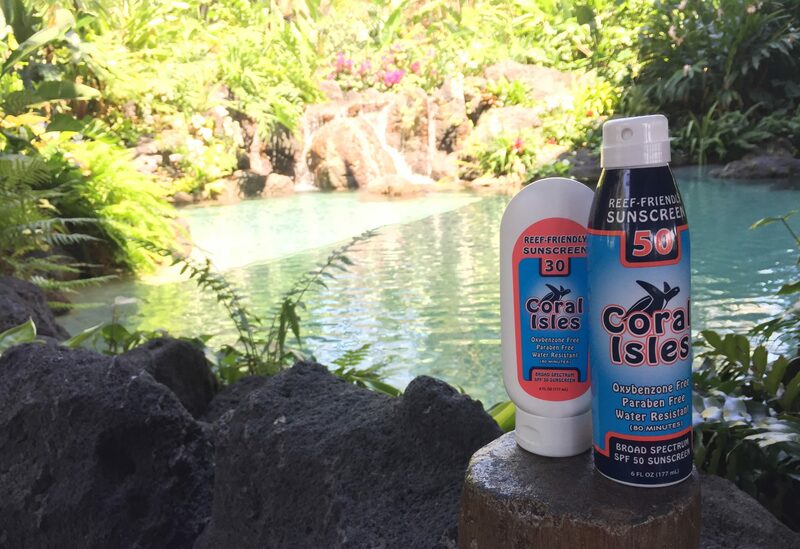 Our two main goals are sunscreen/ sun care education and Coral Reef conservation efforts, so we are happy if you use any kind of Reef-Friendly SPF to protect yourself from the sun! Skin cancer is no joke, and neither is Reef Bleaching. In both cases, “an ounce of prevention is worth a pound of cure”. The best sunscreen out there is the one you will actually wear. Always look at ingredient lists to make sure reef-damaging substances (such as oxybenzone, butylparaben, octinoxate and 4-methylbenzylidine camphor, all of which have been shown to cause coral bleaching even at low levels) aren’t included. Together, we can make a difference! Cruelty-Free, Oxybenzone Free, Hypoallergenic Coral Isles is the best: protect your skin, protect the reef!